Call our Professional Roof Inspectors at: 888-766-3800 to schedule your Roof Inspection appointment today! • Drone inspection of your roof will be performed by a NRCIA Certified Roof Inspector. • A thorough drone inspection with an overview of the roof surface with special attention to all the critical areas including: pipe flashings, chimney flashings, valleys, vents & skylights. • A Drone Roof Inspection Report will be given to you within 24hrs of inspection complete with photo observations and recommendations of repairs or replacement. • Estimates will also be included in the report. There are certain roof types that you do not want anyone to walk on. There are types of roofing that are very fragile and there are steep roofs that are dangerous. For example, clay tile roofs are extremely fragile and break very easily. Metal roofs are weak and would dent with people walking on them causing unwanted damage and potential leaks. 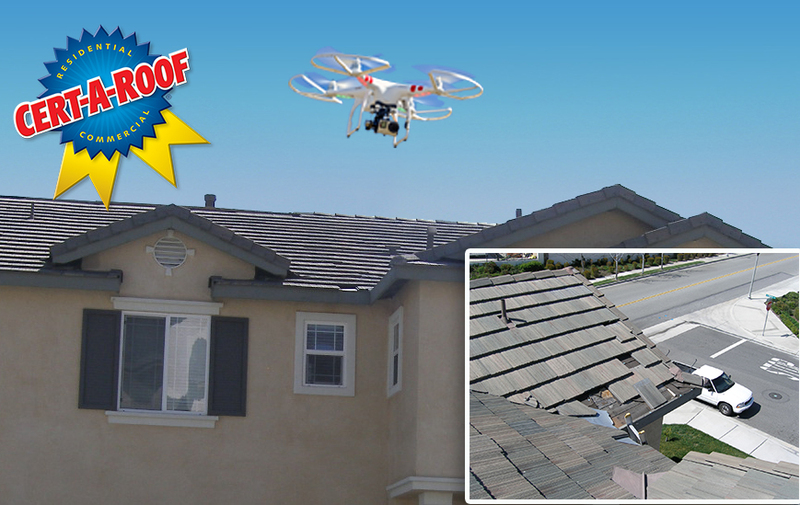 Even if you do not suspect a roof problem, a huge advantage of having a drone inspection is that it documents the current condition of your roof prior to any storm damage. • Recommended for home 2,500 sq ft. or less. $10.00 surcharge for every additional 100 sq.ft. Watch this video to learn about our roof inspection process. During the LeakFREE Roof Inspection process, it is the objective of the inspector to qualify the roof for a LeakFREE Certification. In order to accomplish this, our inspectors are highly trained to recognize necessary roof repair work and for conditions which might cause a roof leak in the future. Following the NRCIA roof inspection protocol, a trained specialist visually first examines the walls, ceilings and attic inside the house to verify any evidence of a roof leak. Evidence can be seen as stains or discoloration in the roof penetrations, near the attic vents, near the center point of the comjunction of two roofs (known as valleys), around any chimneys, or in the sheathings for the roof. Any evidence found during the initial visual inspection of the roof tells the roof inspector what to examine most closely during the roof’s actual inspection. The next thing the inspector examines is the perimeter of the building. This is to look for further evidence of leaks or damage. This includes verifying if there are any water stains on the outside of the building or under fascia boards, as well as looking for any dry-rot or damage on the rafters or in the eaves. Once the interior and perimeter visual examinations are complete, the inspector visually (non-destructively) examines the roof itself. Every roof type has common crucial areas and all of our specialists are trained to pay special attention to each of these potential trouble spots. Lastly, the inspector will create and deliver a thoroughly written report. Only our proprietary Inspection PLUS® roof inspection software can generate a written roof inspection report that includes digital photographs, detailed notes and a estimate of repair costs. The roof inspector sends the report within 24 hours of the inspection to show the homeowner (or homebuyer, home seller, or their real estate agents) what is needed to qualify for a LeakFREE® Roof Certification. Looking for quality roof inspection? What describes you best?